Today's fight in the prepaid market is fought by the major carriers - Verizon, AT&T, T-Mobile, and Sprint - so their virtual MVNO offshoots had to reinvent themselves. Each one is now targeting a certain niche, either geographically, or with unorthodox amounts of data at rock bottom prices, too, in a way to differentiate from the big four. The little guys usually ditch a few added features in the process, but those are of the type you might not be using on a regular basis anyway. One of those unsung prepaid warriors - Boost - is a Sprint offshoot and a pretty popular one at that. It is using the carrier's network to offer a $60 unlimited plan with the whopping 30GB of hotspot data at full speed to boot. Then, again, it's Sprint's network, so if it has good coverage in your area or the places you frequent when traveling, you are golden. Here is an overview of Boost's current plan prices and features, compared to the rest of the prepaid gang. The $60 a month Unlimited Plus option is a sweet upgrade over the $50 one, as it sports a 30 GB hotspot and HD streaming. The $80/month Unlimited Ultimate ups the hotspot ante to 50GB, but if you don't need that much sharing and aren't planning on traveling abroad, it's not worth shelling out the extra twenty for it. 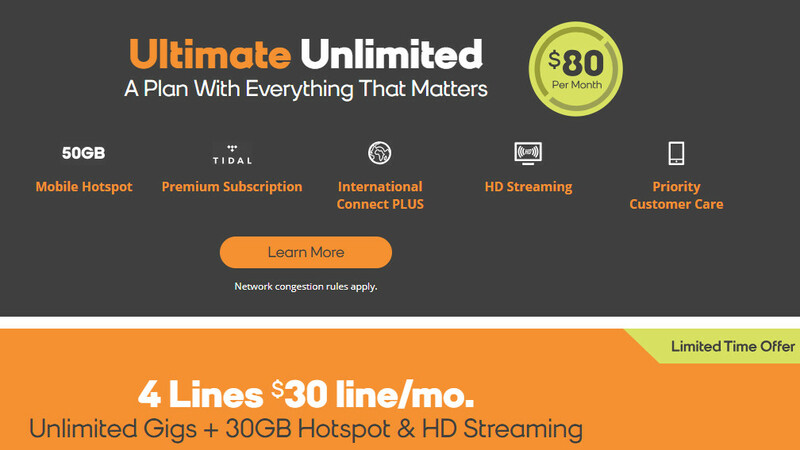 If you need more lines, for $30/month on four lines, you will get all that the $50 single line plan offers, too.